Build & Manage Your Care Team with Ease. CareZare is a free app that empowers caregivers to stay on top of caring for their loved ones. Involve other family, friends and professional outside services in the caregiving process. Simply assign, log & track care activities, ongoing tasks and visits, on the fly. Ensure that your loved one has what they need and their care team knows what to do. tasks as your loved one’s needs change. Stay connected and put your mind at ease with an up-to-the-minute journal, real-time notifications of care tasks events, and history of care, right at your fingertips. loved ones while also taking care of themselves. CareZare empowers family caregivers to take the best possible care of their loved ones while also taking care of themselves. CareZare allows caregivers to take a team-based approach to caregiving instead of going it alone. Involve other family, friends and outside professional services on a single platform for ease of communication and better care. 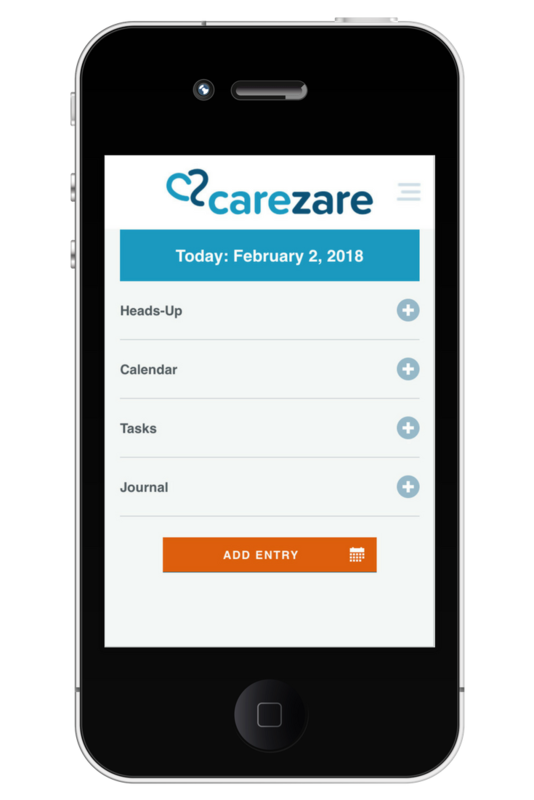 With a simple, user-friendly interface, CareZare guides you through the caregiving process, which can often be overwhelming, proving a communication platform that allows you to track visits, feedback, care tasks and more in one place. Are you a business serving caregivers that is interested in sponsoring CareZare? Our carefully selected sponsors allow us to provide the app to family caregivers for free. Learn more about sponsorship.